Coming over to Thailand? I bet you guys probably did your research and found out that visiting a floating market is a must-do. Exploring the local lifestyle and eating all the delicious local food at a floating market is surely one of the best ways to enjoy your getaway to the Land of Smiles. But, hey! There are a few activities you might enjoy more than just walking and eating at a floating market. What kind of the awesome things you shouldn’t miss at a floating market then? As good as it may sound, you can enjoy watching these magical little light bulbs and its surroundings. With these tiny stars in the air coupling with the sound of the canal, the feeling of relaxation will truly ease your mind. The night sky then enhances the atmosphere, harmonizing with the background of the local environment, creating the best moment that will last in your memory. Where to: If you are interested in this magical experience, just head to Amphawa Floating Market. The destination is located in Samut Songkhram province which can be reached by highway number 35. There are various boat vendors waiting to sell you delicious food, together with a lot of activities that you can do in this floating market. 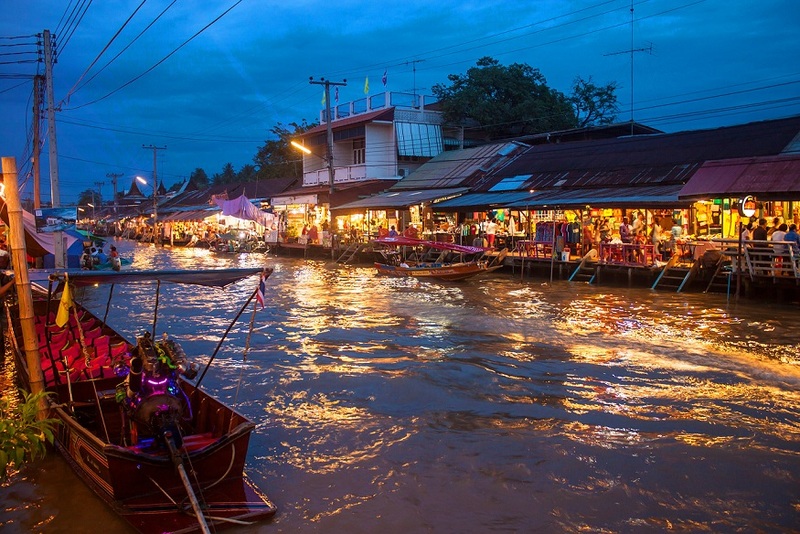 How the locals do it: Besides the floating market, Amphawa district has numerous attractions that can be discovered just a couple of hours from the bustling capital. It might be a good idea to visit those places during the day and return by dusk. Savory meals in local boat vendors is no ordinary thing. 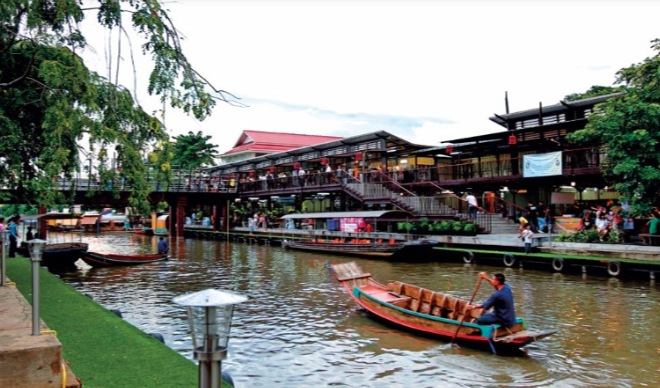 Through the exotic dining location, you can enjoy Thai traditional food along the canals. Whichever Thai dishes you’d like to taste, it will be surely to your liking. Where to: To enjoy the boat meals, it is not necessary to travel afar, but only to the heart of Bangkok itself. Kwan-Riam Floating Market is inspired by a Thai melodrama film, known as a Thai version of Romeo and Juliet. How the locals do it: From 7:30 to 8:00 am, there will be a Thai traditional ceremony (almsgiving) which people offer food to monks. The ceremony for the market is more special than others as the monks will join by boats. Stepping into a 150-year-old market, you can hear voices of the past hidden inside. Its wooden floor will creak at every step. The awareness of the long-encapsulated histories and heritage will surely pop up in your mind. The shops and stores here are examples of the steadfast will of the people preserving their heritage. Handmade merchandises are well-crafted, reflecting the wisdom of ancestors passed upon to current generations. Where to: Bang Phli Floating Market is on the canal side of Wat Bang Phli Yai Nai in Samut Prakan. How the locals do it: During Thai important religious weekends, boat services are available for the the Nine Temples Worship tradition. It is believed that if you worship nine temples in one day, you will be in good fortune. Apart from eating away all the delicious food at a floating market, exploring its neighborhood and enjoying local activities is a must. Looking for some activities or things that are unique and personalized? Look no further! Where to: Forget what you have seen at any other markets because you just can’t miss this floating market and its community in Samut Prakan province. Bang Kra Chao district is personally one of my favorite places. Known as Bangkok’s Green Lungs, many fun activities and friendly folks await. Also, you can learn some local handcrafts and enjoy your chilled day like no others! How the locals do it: Venture into a small alley right across Bang Nam Phueng Floating Market. You will reach a small workshop where you can learn tie-dyed clothing and aromatic incense making. Marching through the war-like scene, the feeling of being a Thai soldier may creep up upon you. Not only you can enjoy traditional Thai performances, but you can also suit up in antique armors and weapons as if it was hundreds of years ago here at Surasi Military Camp Floating Market. Where to: Surasi Military Camp Floating Market is in the Thai Army’s vicinity in Kanchanaburi province. Many tourists constantly give the place a visit as it is not very far from Bangkok. Various food stores and souvenir shops are also available in the market. How the locals do it: Other zones inside the army camp are also tourist attractions. Besides, you may want to bring a group of friends to enjoy activities such as paintball or rock climbing.